Hi there! It’s the last day of the month, so it’s time for my monthly favourites post! 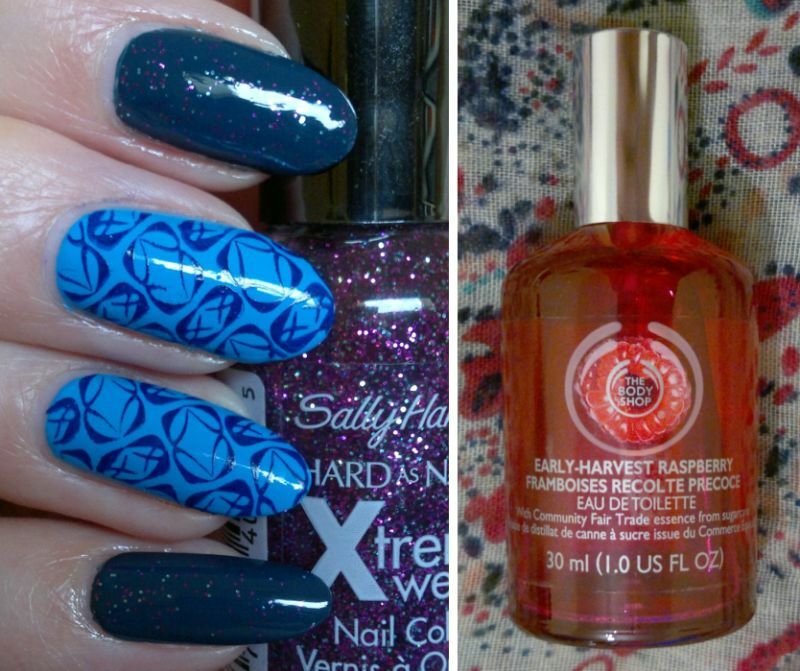 As always, I’ve chosen my 3 favourites from all the products I’ve reviewed this month. And I’ve thrown in a few honourable mentions as well. Let’s start with the TOP 3! It took me a few days to fall in love with this product. After the first try I wanted to return it. But I’m glad I didn’t. Yes, this mask is unusual, but it’s amazing, and that’s all that counts. I could kick myself for not trying these shower gels sooner. If you’re looking for shower gels to go with your Prada Infusion d’Iris or Flower by Kenzo frargrances, look no further! 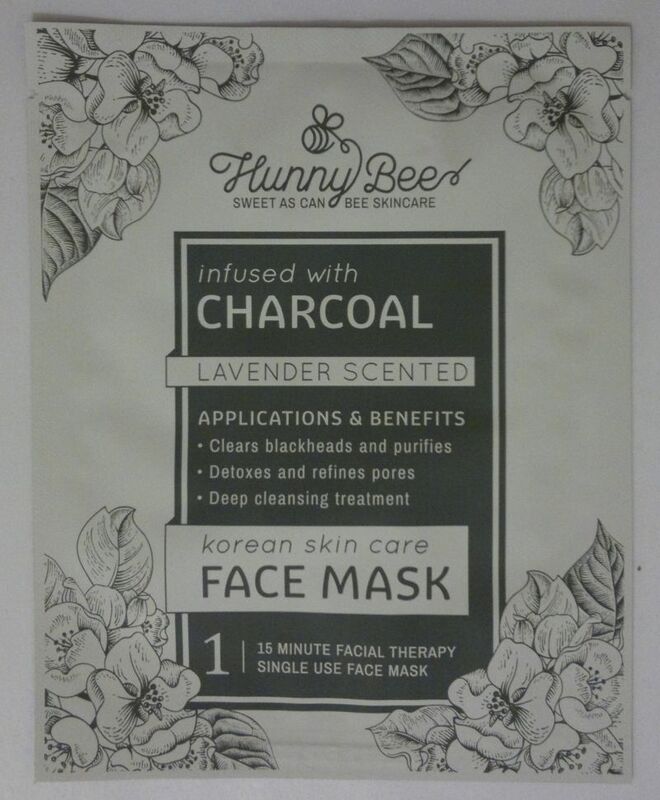 Hunny Bee’s Charcoal & Lavender sheet masks are really something. They made my skin look and feel cleansed and refreshed, and they made my pores appear considerably smaller. Awesome stuff! Onto the honourable mentions! Garnier’s Pure Active Fruit Energy Daily Energising Gel Scrub is very good. 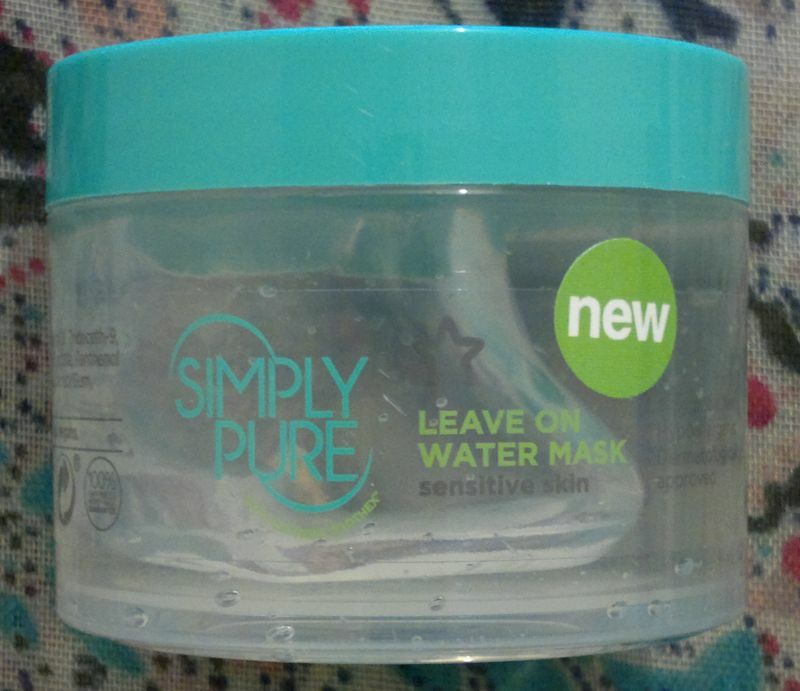 Boots’ Extracts Luscious Vanilla products are all-time favourites, and Superdrug’s Cucumber Peel-Off Mask is very nice! Have you tried any of these products? Which products did you love the most this month? Feel free to comment. And thanks for stopping by! 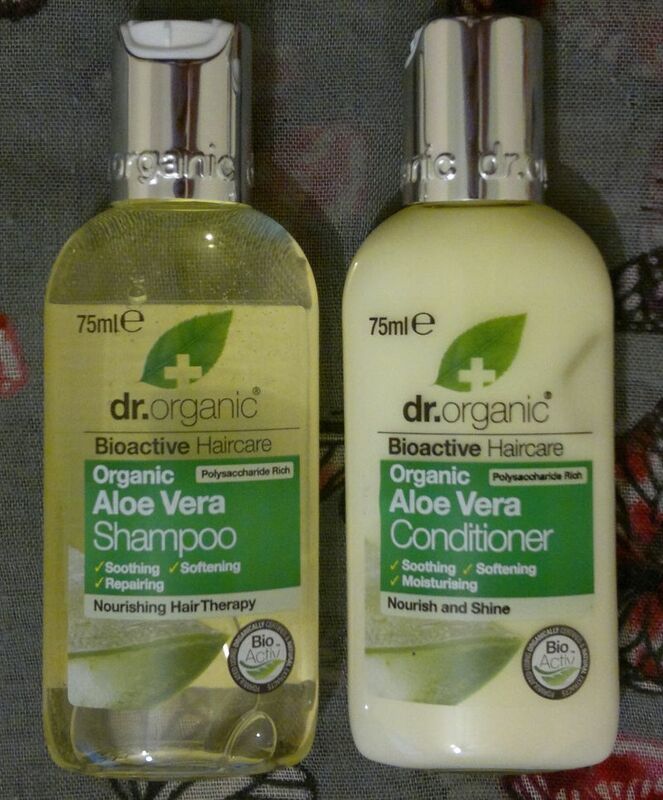 On Monday I reviewed Dr. Organic’s Aloe Vera hair products. Click here to read the post. 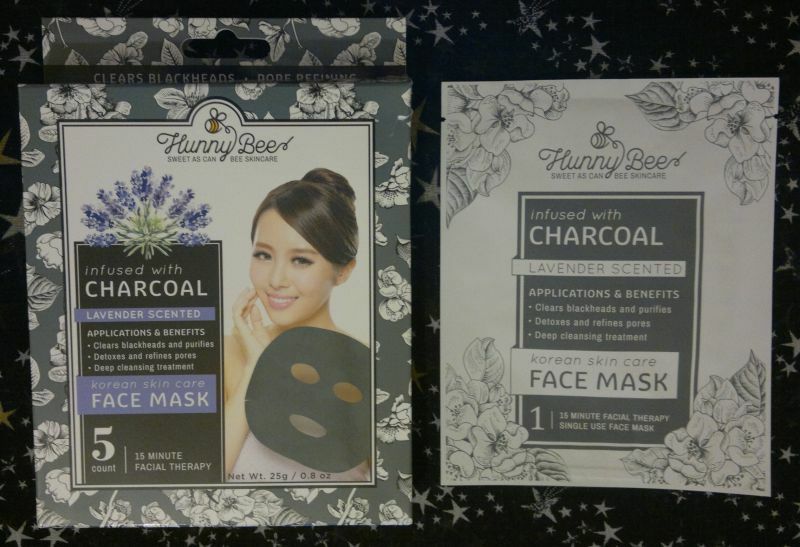 Tuesday’s post was about an awesome face mask. Click here to read the post. 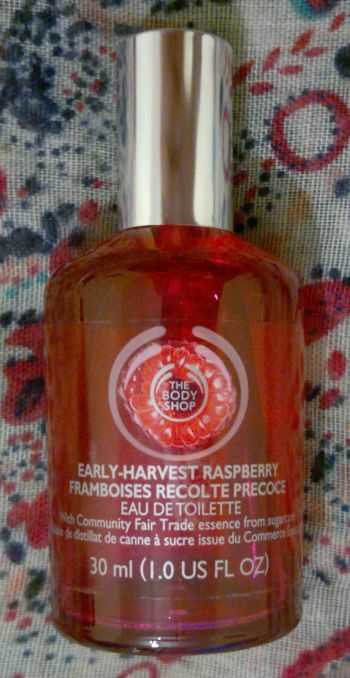 On Thursday I reviewed The Body Shop’s Early-Harvest Raspberry EdT. Click here to read the post. On Friday I reviewed a Grace Cole body butter. Click here to read the post. I agree that this body butter is nourishing. Once applied, it feels a bit sticky. But after a few minutes it’s perfectly fine. The fragrance is quite pleasant as well, but it’s pretty much watermelon only. I don’t smell any grapefruit at all. Anyhoo… I’m glad I bought this product! I didn’t love the matching shower gel, but the body butter is actually quite nice, and I would recommend it to anyone with dry skin! 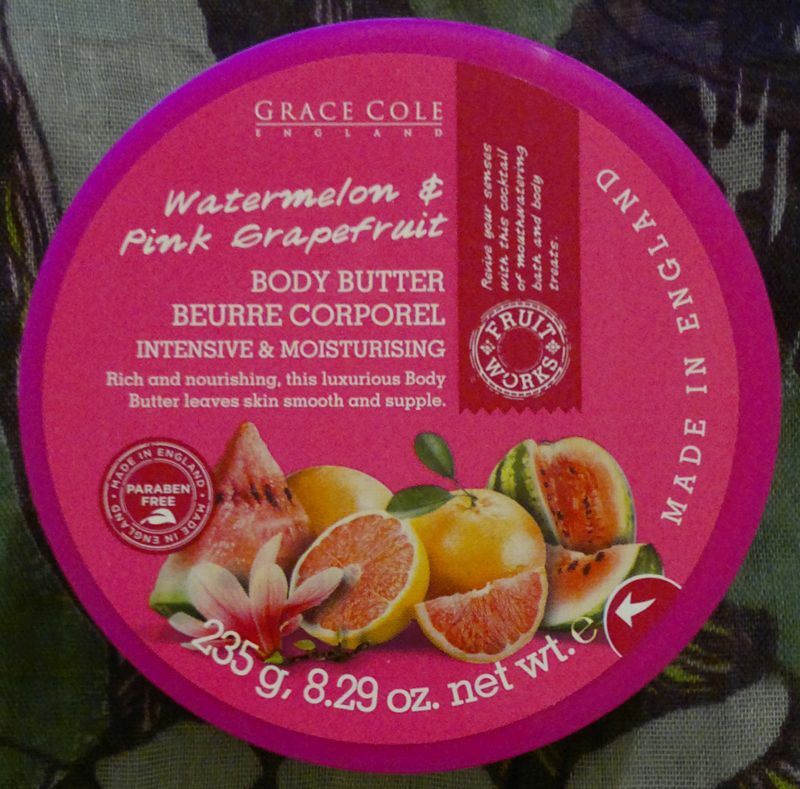 Grace Cole Fruit Works Watermelon & Pink Grapefruit Body Butter is available as 235g. I paid 99p for the tub (Home Bargains). I’ve also reviewed the matching shower gel, and you can read the review here. For this mani I painted my nails with Revlon Colorstay 170 Coastal Surf (middle and ring fingers, 2 coats) and Revlon Colorstay 290 Midnight (pinkies, index fingers, thumbs, 2 coats). 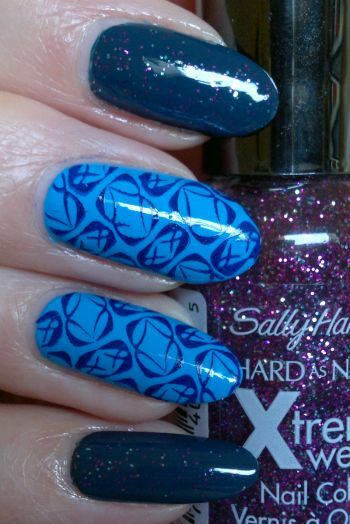 The glitter polish I used is Sally Hansen Xtreme Wear 235 Supernova. I also used Pueen‘s 81 stamping plate (which is part of Pueen‘s Buffet Leisure collection). The dark blue polish I stamped with is Filthy Gorgeous Midnight. I think this mani was quite alright. For some reason I couldn’t make the glitter pop in the photos, but in real life it looked cute and sparkly!